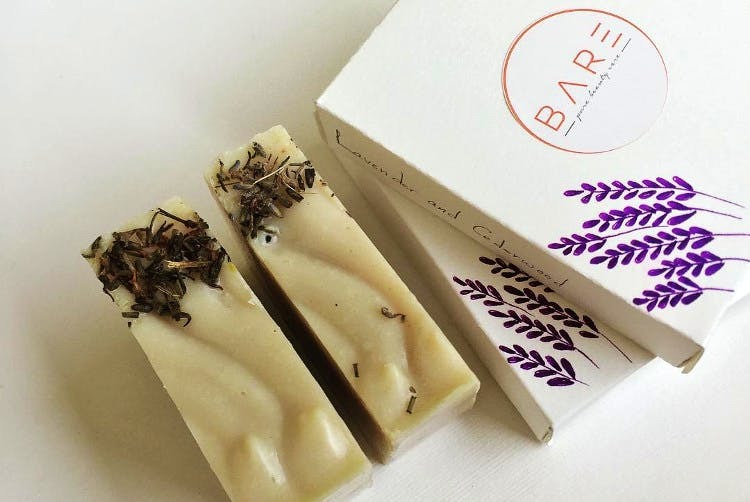 Love handmade soaps and cannot get enough of them? Then you've got to check Bare Pure Beauty — a Hyderabadi brand that swears by natural ingredients to pamper your skin. After discovering Bare Pure Beauty in a flea market, we kept going back to it for our share of handmade soaps. Available in a few flavours, they arrive at your doorstep in a pretty package (they ship India wide). We recommend the Grapefruit & French Rose Clay soap as it leaves your skin well moisturised but if you're looking for a great detox, the Activated Charcoal & Tea Tree Oil does the deed. Plus, it works on your acne. Shipra Nayyar, who runs Bare Pure Beauty believes that organic produce works wonders on skin and handpicks the raw materials that go into these products. We got our hands on Roasted Coffee & Decadent Cocoa Face Mask that leaves your face glowing and it acts as a scrub too. Not to forget, we love how it smells. They also have a variety of ubtans and lip balms that you can check out. The price of the products begin at INR 250 and can go upto INR 750. Although the face masks are quite effective, we'd like it if they were in paste form rather than powder. Bare Pure Beauty by Shipra has a label called Ozel Bir Sey under its umbrella, which makes stunning clutches and potli bags. They have a tiny kiosk inside Inorbit Mall where you can get your hands on them. If you're looking for Christmas or New Year gifts for your fam, you'd love this.